The team at German Car Depot provides a full range of expert automotive repair and service exclusively for Volkswagen, Audi, Mercedes Benz, BMW and Mini vehicles. From the more common services listed on this page to even the most complicated of engine repairs, when you need a professional German car auto mechanic, GCD is the shop to call. Oil and Filter Service: We use only 100% synthetic oil as recommended by the vehicle manufactures. 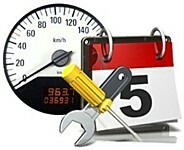 At German Car Depot an oil and filter service also includes a full mechanical inspection of your vehicle. Our technicians will check over 27 items including the condition of your timing belt, cooling system, charging system, brakes, all fluids etc. This inspection helps identify potential problems before they actually become problems. Timing Belt Replacement: One of the most important services that should be performed on your vehicle is a timing belt inspection or replacement. If the timing belt is neglected and allowed to break, thousands of dollars of damage could occur to your engine. The recommended intervals for timing belt replacement varies between 40k and 80k miles depending upon the year and model of the vehicle. When your vehicle is brought to German Car Depot for an oil change, a scheduled service or any repairs, our technicians check the condition of your timing belt, this is an easy procedure often overlooked by other mechanics. TDI Diesel: TDI (Turbocharged Direct Injection). When properly maintained the VW / Audi TDI will deliver exceptional fuel economy and longevity. These engines are unique and require specialized knowledge and tools to properly service. Our technicians can diagnosis and repair every system and component on your TDI. Automatic Transmissions: Most problems with the Audi and Volkswagen CVT, DSG and Tiptronic transmissions are electrical and not the transmission's internal hard parts. The German Car Depot technicians have the specialized scanning tools and training to quickly diagnose transmission problems without the guess work. German Car Depot can repair many common transmissions problems without having to perform a complete rebuild. This can save a customer thousands of dollars. Scheduled Maintenance: The German Car Depot technicians will inspect, adjust and replace parts according to the manufacturer's recommended specifications and intervals. Brakes: When German Car Depot services your vehicle, we check your brakes on every visit and record the pad thickness to better learn how you drive your car. When it's time to have the brakes serviced we will send you a friendly reminder. Electrical System: The most common repairs of VW & Audi vehicle electrical systems are replacing window regulators, headlight bulbs, starters and batteries. Changing the battery on a VW or Audi vehicle is more involved than you might think. Depending on your model and year you may need to reprogram the vehicles onboard computers and reset the radio code. Whenever we replace a battery, we also test the alternator and perform a complete charging system inspection. Air Conditioning: The air conditioning climate control in late model Volkswagen and Audi vehicles are sophisticated systems requiring specialized knowledge and tools to properly service. The German Car Depot technicians have the required scanning tools, training and experience to quickly diagnose and repair even the most complicated AC problems. To keep your air conditioning system at peak performance and help avoid costly repairs, it is recommended to have your air conditioning system serviced every 2 years. 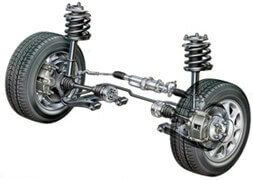 Struts and Strut Mounts: When strut mounts are worn they will usually make a rattling noise when going over bumps, cause your car to drive harsh and wear the front tires unevenly. VW and Audi vehicles rarely need new struts, even after 150,000 miles. Many repair shops and even new car dealer service departments might try to sell you struts but most often it is only the mounts that need replacement. Control Arm Bushings: When control arm bushings wear out, your car will tend to wander a little on the highway, not hold a proper front end alignment and wear the tires unevenly. Replacing the control arm bushings can restore the tight and precise handling Volkswagen and Audi cars are know for. Shifter Bushings: Depending on your driving style shifter bushings wear out gradually over several years, this will cause internal gearbox parts to wear more quickly and make the shifter feel sloppy and less precise. This is an inexpensive repair that will make your manual transmission car fun to drive again! On newer models of VW and Audi vehicles a cable shifter is used, these are also an inexpensive item to repair. Hydrolock Engine - Water Damaged Engine: Hydrolock (short for hydraulic lock) is the immobilization of an engine's pistons by a liquid such as storm/rainwater. Automotive engines are designed to compress a gas/air mixture. If a significant amount of water is sucked into the engine's combustion chamber through the air intake, compression becomes impossible. As a worst case scenario, Hydrolock will cause very significant engine damage.